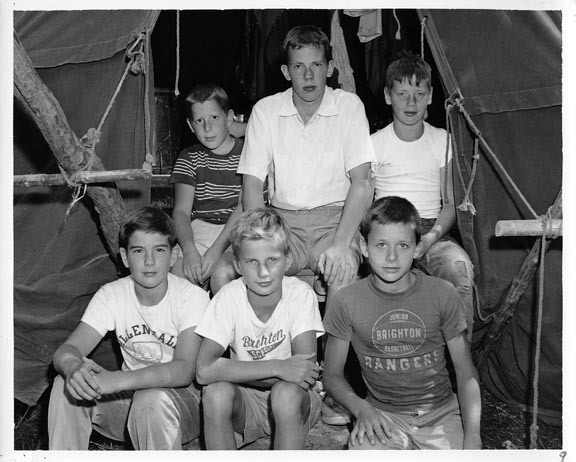 Mac Mellor writing -- Formal official photo of Tent 5 in 1957 councilor (Mellor) with campers (back row, left to right) Charlie Dobbins, Jimmy Allen, (front row, left to right) Sheldon(?) Harris, Ricky Malm, and Joey Hallett. Were all the campers in this tent from Rochester? Top row: Charlie Dobbins, Mac Mellor, Jimmy Allen. Bottom row: Sheldon(?) Harris, Ricky Malm, Joey Hallett.